Lagenaria siceraria, called Lauki, Bottle gourd, Opo squash or Long melon is a close relative of pumpkins and squashes - the dried fruits are popularly known as calabashes. It is a vigorous climbing, creeping or scrambling annual vine with stems that are supported by tendrils and large, somewhat toothed rounded leaves that are hairy below. There are also hairs on the leaf stalks and young fruits. The young shoots, tendrils and leaves can be eaten as greens. In Southern Africa the leaves are eaten as a vegetable/ added fresh to maize porridge/ mixed with other plants made into a relish or dried for later use. The immature fruits are added to stews, cakes, curries and fish dishes. To use culinary - choose a young, firm calabash for best results. Peel, discard harder portions of the skin and scoop out and discard seeds before cooking. In India the skin of the gourd is used in making chutney and in Burma the young leaves are boiled and eaten with spicy hot, fermented fish sauce. The leaves, tendrils, young shoots, immature fruits and the dried fruit. 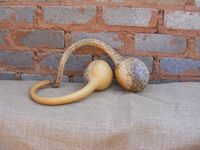 The bottle gourd is low in fat and cholesterol yet high in dietary fiber. It contains 96% water and per 100g it contains around 12 calories. It is rich in iron and has vitamins C and B complex. Bottle gourd contains sodium of 1.8mg per 100g and 87 mg of potassium - making it a suitable vegetable for hypertensive patients. It is easily digestible - excellent for light, low-calorie diets, small children, people with digestive problems, diabetics and convalescents. Cooked bottle gourd is cooling, calming, anti-bilious and diuretic. It helps treating urinary disorders - a glass of fresh bottle gourd juice mixed with lime juice combats the burning sensation caused by the high acidity of urine. A glass of Bottle gourd juice with a little salt added, is an excellent remedy for excessive thirst caused by diarrhea, over consumption of fatty or fried foods and diabetes. Juice from the Bottle gourd's leaves is good for jaundice. Calabash can be used as bird feeders and nest boxes. In rural Southern Africa, calabashes (dried and hollowed out Bottle Gourds) are used for typical utensils such as ladles, bowls, cups, bottles and containers to keep liquids, floats, pipes and musical instruments. It can also be used for carrying water, or can be made for carrying items, such as maize, etc. Painted and decorated products made from calabashes are also offered for sale at roadside stalls and curio markets. In some countries it is worked, painted and decorated as shoulder bags or other items.